Superman under Poison Ivy’s mind control. Even though Batman and Superman have fought and won against one another multiple times in the past, it’s always worth paying attention when they do, because the heated, ongoing debates about how Bruce could ever body Clark are never going to end. Everyone knows that Batman is the greatest detective in DC’s universe, and he has detailed contingency plans specifically designed to take out virtually any person with super abilities should the need ever come. 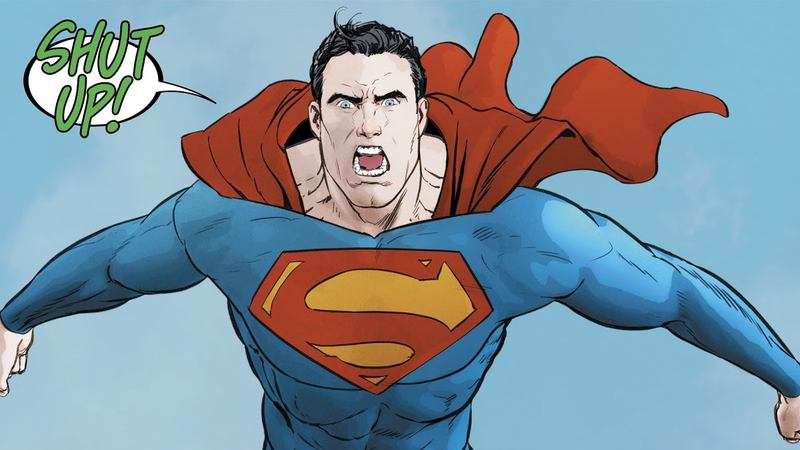 Kryptonite’s always been one of the most immediate solutions people bring up when discussing how Batman would fight Superman, but writer Tom King knows that the mineral has no place in a truly interesting brawl between the two. One of the most delightful things about reading King’s current run on Batman has been seeing the interesting, curious ways the writer draws so much out of the series’ characters without ever letting the larger story arc feel too large and unwieldy. As is almost always the case, less is more. Because Bruce and Selina Kyle insist on being costumed vigilantes who live in Gotham City, they’ve been largely unable to enjoy their recent engagement thanks to Poison Ivy’s latest scheme to reclaim the Earth in the name of the Green. As “Everybody Loves Ivy” begins in Batman #41, Bruce is startled awake just as Ivy is pulling literally every single sentient being on the planet under her control through some unknown botanical means. Bruce is unaffected by Ivy’s effect (see: contingency plans) and he’s able to dose Selina with a serum to protect her just in time to make the two of them the last two people alive who are free of Ivy. The newly-engaged Batman and Catwoman enjoying a drive through Poison Ivy’s apocalyptic utopia. Because Ivy’s now connected to everything through everyone, she’s more than content to let Bruce and Selina wander through the new world, presumably helpless to reverse what’s happened. But Ivy still knows that Batman’s never to be underestimated entirely, so she sends a mind-controlled Superman to chaperone from a small distance as Bruce and Selina go for a pleasant drive to discuss their upcoming wedding. Both Selina and Bruce know that Ivy can hear everything they’re saying by using Superman’s enhanced hearing, and while Selina uses it as an opportunity to point out to Ivy how ridiculous she’s being, Bruce sees it as a chance to show off one of the ways he devised to best Clark. As the couple are driving along with Superman diligently following them, Bruce leans in to whisper into Selina’s ear, gradually pushing his voice lower and lower to make sure that Clark is straining to listen in. And then Bruce whistles very loudly and the intensity of it knocks Clark right out. Batman whistling to incapacitate Superman. It turns out that the whistle maneuver was what Bruce was telling Selina about and she admits that she was wrong to doubt whether it would work as Clark hangs, unconscious in a tangle of power lines. To Clark’s credit, Bruce explains that the only reason his trick worked was that Clark would know better than to listen so closely and that, technically speaking, he was exploiting Ivy’s lack of familiarity with Clark’s ability. But the point still stands that Bruce has planned for virtually anything, and that even without glowing green rocks on his side, he’s got more than a few ideas in his head about how to at least get a couple of good hits in on Superman.